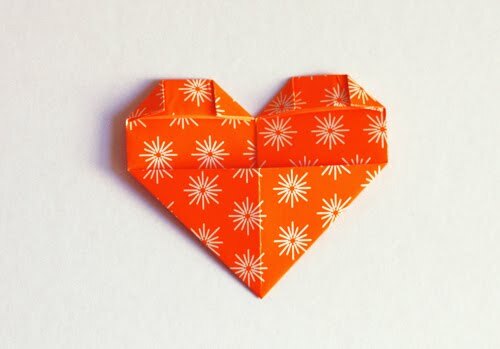 Here's a quick little origami project that's fun to do with patterned paper: heart-shaped bookmarks that slip onto page corners. You could mail somebody a couple for Valentine's Day. Turn the paper over. Fold the top downward. You can eyeball this; about 1/3 of the top section gets folded down. Wow, so speedy! Looks great! Perfect valentine gift for gifting book club buddies! Genius!! I'm going to include this in a home decor/usefulness roundup I'm posting later tonight. Thanks for this tutorial and the Valentines idea. I've seen this before but never thought to use it as a bookmark so didn't think to make it. 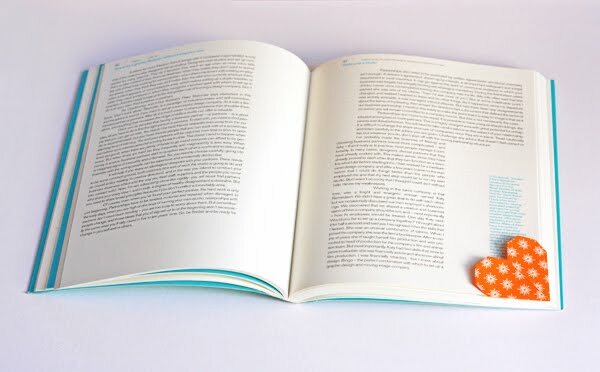 Would make a lovely token to give with a book gift too! Um, I am making these asap. I was just thinking today how much I need a new bookmark. 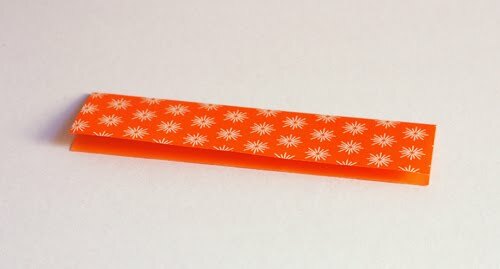 I used to make these when I was in grade school, but never thought of making half of one as a bookmark. Such a wonderful idea! Good idea and lovely papers ! thats fantastic! 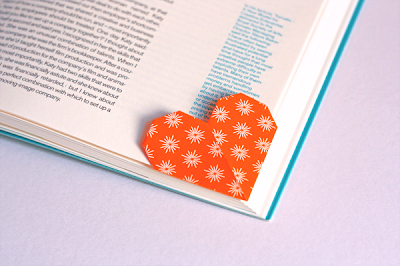 I always use old bus tickets or paper stripes I just found next to me, but this is a great solution to pimp the book and for sure I will read much more the next time, so I can use this wonderful tiny hearts frequently! 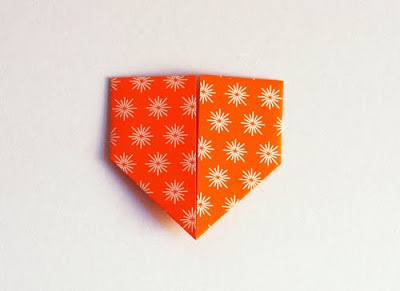 These are adorable - can't wait to start making some! 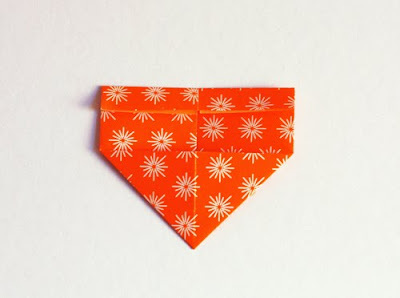 Is there a way to stiffen fabric to use it for this? Lovely idea! So easy n beautiful! Thanks for sharing ! Lizabeth, here's how I've stiffened fabric in the past. That should work for this project. Press the folds flat with an iron. could not stop creating them - now every book on my desk got its own tiny heart - thank you so much for sharing! What a fun idea! I think this will be our Valentine's Day craft with the boys. Great idea for valentines for kids classes. Fabulous! Oh that is a cool little idea!!! So cute! I think I am going to make these for Valentine's Day, I think a lot of my friends and family would love these. Thanks for sharing. It is a amazing usage! I'm feeling really dumb...I must be skipping a step? My hearts have a crease down the middle where they open up. Is that they way they are supposed to be? Do you mean there are two flaps of paper that meet in the center on the front side? If so, that's right. 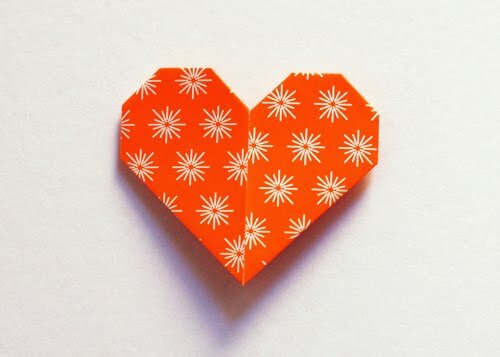 If they're not laying flat, you can try Hanna's good suggestion of ironing the heart for a bit to make it flatter. Make sure you fold very precisely, which will help, too. 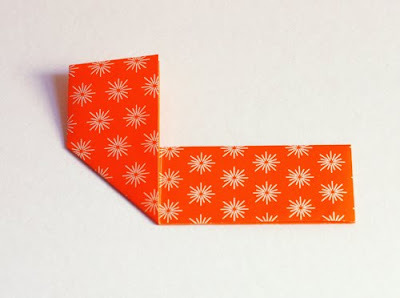 If you're talking about a fold somewhere, I'm quite sure without seeing it. Thanks to you, I've found a way to become more creative! I've been following your blog for quite some time, and suddenly, I completely became a regular reader of yours. I think we'll make these today. In looking at yours again, I'm impressed with how your patterns came together on your pink and blue hearts! Cool! Total accident. And a tip: use thin paper; it works better. 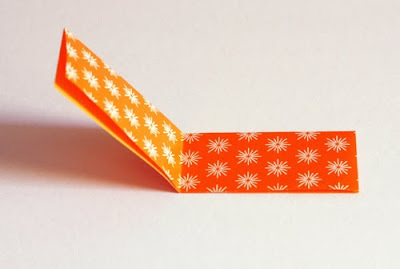 If you don't have origami paper, try wrapping paper. I needed a bookmark and found your blog, the tiny heart is so cute, since I'm an anime fan I glued a picture of my favorite character and it's perfect (for me), thanks a lot for the tutorial; and by the way, I love your blog. 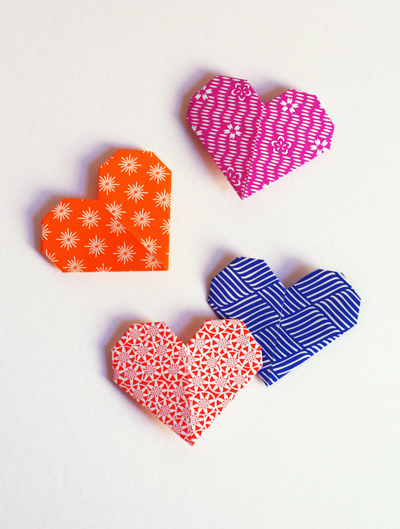 Your directions were so very clear and easy, and these little hearts make a great Valentine's project! I've linked to your tutorial in my blog at SympatheticThreads.com. Thanks! I need your help. I love your pictures and very simple, clear directions and yet I'm still messing it up. My hearts are turning out with a long slit down the middle and nothing holding it together. I have no idea what step I've messed up or skipped but would love your insight! I'm medically homebound at the moment and would love to spend the day working on these! Hi!! I tried . . . it came out beautiful, but I must be doing something wrong since the final result is a heart with a slit in the middle . . . I'm thinking of gluing a little circle to join both flaps; if not, it does not remain on the page. Thanks for sharing. I purchased 3 books for my twin granddaughters and one for their mom so that they can start a tradition of reading the same book and then together and talking about the book so I made these cute little heart bookmarks for them ,and printed a baby picture of them and glued it on the heart bookmarks and mod podged ....soso cute! Thank you! I made it out of scratch paper that I had and covered in washi tape! v cute!